You didn’t think I’d leave town without visiting at least one cemetery, did you? On March 14, 1908, there was an explosion at the Natchez Drug Company in downtown Natchez, Mississippi. Company managers thought that there was a gas leak in the building, so called in a plumber to find it. And how did they find gas leaks in 1908? They used a candle flame. The plumber found the leak, which caused an explosion, which caused a fire, which spread to adjacent buildings. The incident killed 10 people: workers in the building, bystanders and neighbors. 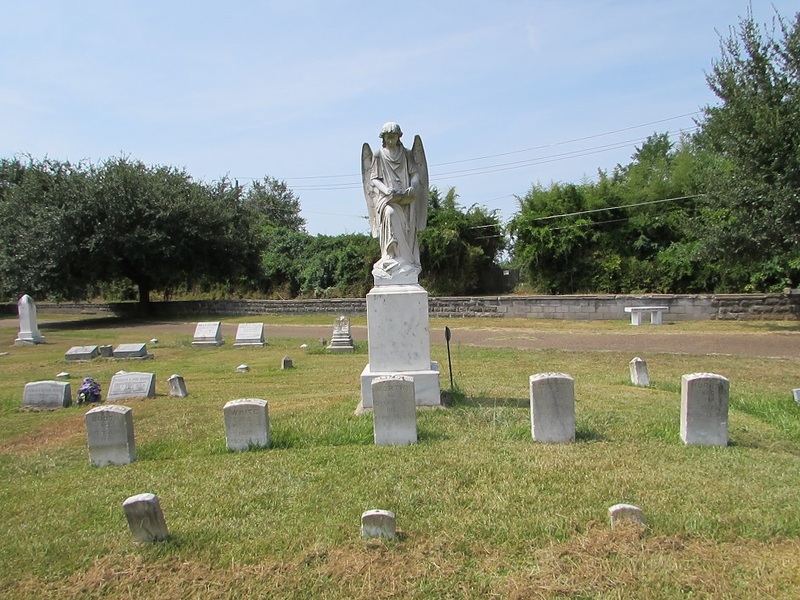 The company owner bought a plot in the Natchez City Cemetery and buried five of his employees there. They’re all young and female — the youngest was 12-years-old — so my guess is that they were the ones whose families couldn’t afford burial plots. Behind them, he had erected a marble monument featuring an angel. The angel is now known as the Turning Angel, because it’s said that she turns to look at cars on the road behind her. She didn’t turn to look at us, but perhaps it takes more than a rented Toyota Camry to merit her attention. 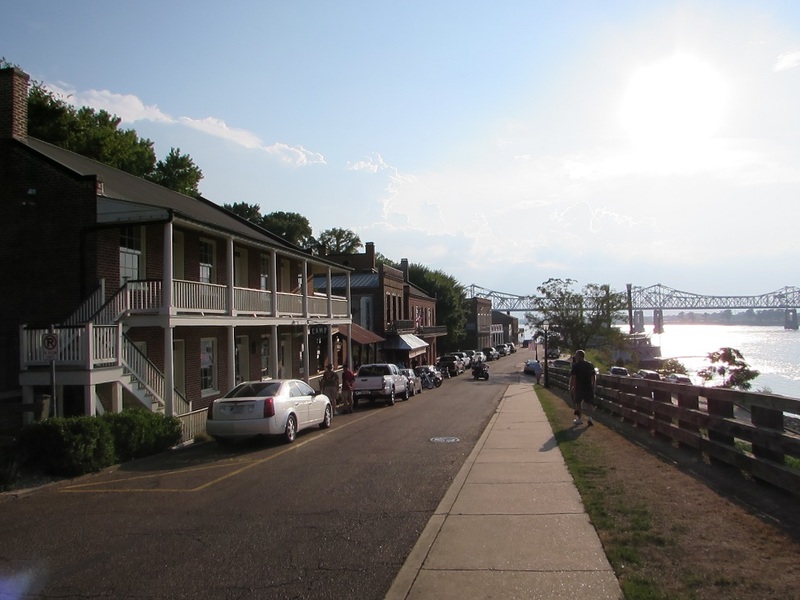 Natchez is in the middle of cotton country and Forks of the Road, at the end of the Natchez Trace and about a mile east of downtown Natchez, was the location of the largest and most important of the slave markets in the area. 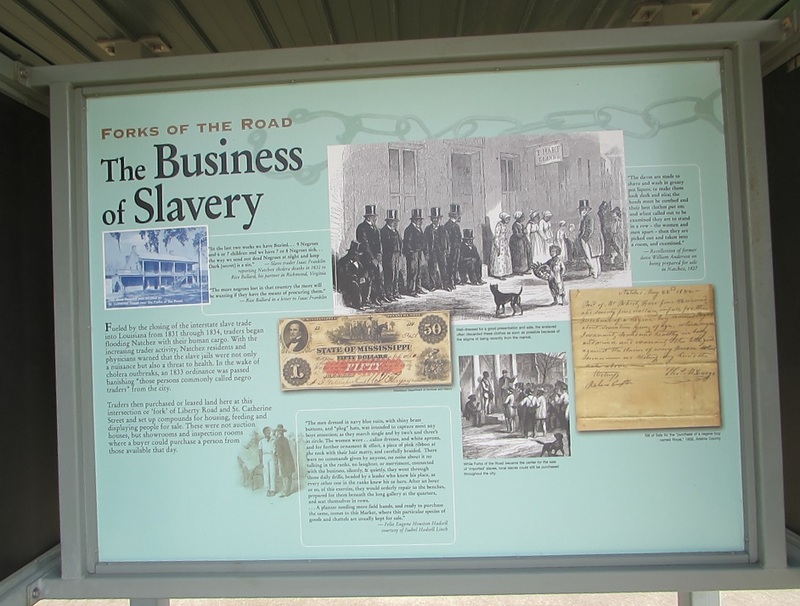 The importance of Forks of the Road as a slave market was tied to Isaac Franklin and John Armfield, the most active slave traders in antebellum US. By the 1830s, they were moving more than 1000 slaves a year from Alexandria, Virginia to their markets in Natchez and New Orleans. And the way that the slaves were moved is that they walked the more than 1000 miles from Alexandria to Natchez. Forks of the Road is now in an industrial area and the slave markets that were once there are acknowledged by several fairly long and thorough descriptive signs along a parking area. If you’re interested in learning a bit more of about Forks of the Road and slave trading in Natchez, the Mississippi Historical Society’s history of Forks of the Road is a short but worthwhile read. “Let’s walk across the bridge and have dinner in Louisiana,” said Mr. History Tourist, at the end of our touring day. Our hotel turned out to be next to the visitor center which, as you may recall, was next to the bridge. So we walked as far as the Natchez end of the bridge, where we learned that the bridge did not have a sidewalk. All that was there was a narrow shoulder. Mr. HT was still game, but I was not walking a mile across a bridge with only two feet and a yellow line between me and a bunch of speeding cars. Guess who won that argument. Our friend, Shelton of Marietta, recommended having dinner in an area of Natchez called “Under the Hill.” Shelton and his wife Susan — fellow History Tourists — have never steered us wrong when it comes to food, so off to Under the Hill we went. Natchez proper sits on some bluffs, and “Under the Hill” is a part of Natchez that is under the bluffs. In the 18th and 19th centuries, it was a port where pirates and prostitutes hung out. Now it’s a trendy restaurant area. We had dinner at a place called the Magnolia Grill, where I had the best portobello mushroom sandwich and sweet potato fries ever. 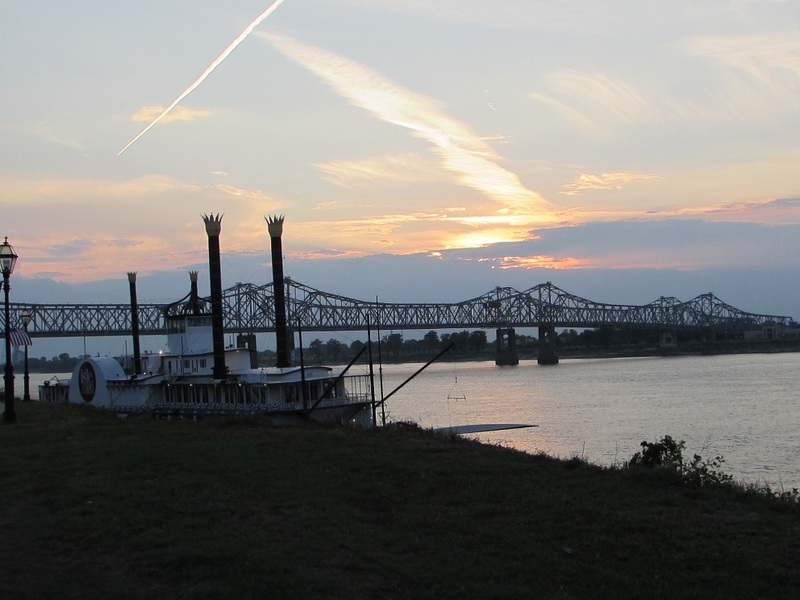 And saw the sun set over the Misissippi. Shelton and Susan’s winning streak continues. My only warning about Under the Hill is that parking is at a premium. We asked the woman at the visitor center — the one who had told us that we could walk across the bridge to Louisiana — whether we could walk down to Under the Hill. On the map, it looked like it was just a few blocks from our hotel. “Oh no,” she had said. “It’s long and it’s steep.” No it wasn’t. Walk, don’t drive. I’m off to see the fall colors in New Hampshire, so this will be it for awhile. We’ll be on our way to New Orleans when I pick up again. Gallery | This entry was posted in Mississippi and tagged Forks of the Road, Turning Angel, Under the Hill. Bookmark the permalink. This was not on my map, along with most of Mississippi. Duly added. I can’t wait to read what you will see in New Orleans! Natchez turned out to be a worthwhile stop. New Orleans was crazy and fun. I hope I can capture just how crazy and how much fun it was. Glad to see you out and about again. I hope you haven’t been working too hard. I look forward to your New Orleans! My visit’s defining word was “delicious.” Thanks for the welcome. I have been working too much, but that nonsense stops now!